Wow just look at these Red Savina's in my Hydroponic System! So What is the Hottest Chile? Maybe after 2006 it was no longer the World record holder for heat at 550,000 Scoville units. But it is still one of the Hottest Chiles in the World and has a great flavor too!A great Habanero for the novice gardener. 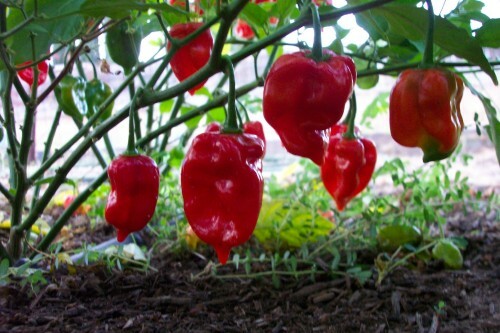 Plant produces an abundance of huge red flavorful pods. Genuine Red Savina seeds are only sold through authorized dealers that get their seeds from Frank Garcia. Red Savina seeds are F1 which means you will get Red Savina peppers when you grow them but the seeds will not give you Red Savina seeds next year because they are F1 Hybrid. That is why the pics you see on other ads do not look like mine. They are Caribbean Red pics or Congo Red pics. I buy from a seed dealer. Yes I grow them but I do not sell seeds of these from my own peppers. Because the seeds will not grow out to be true Red Savina. So keep in mind that it is worthless for you to save seeds from any F1 Hybrid whether its a Red Savina or a Tomato. And if anyone says these seeds are from their own garden.... well I need not say anything more. Use caution when handling any hot pepper or pepper seed and keep out of the reach of children.